Explanation: Who guards the north? Judging from the above photograph, possibly giant trees covered in snow and ice. The picture was taken last winter in Finnish Lapland where weather can include sub-freezing temperatures and driving snow. Surreal landscapes sometimes result, where common trees become cloaked in white and so appear, to some, as watchful aliens. Far in the distance, behind this uncommon Earthly vista, is a more common sight -- a Belt of Venus that divided a darkened from sunlit sky as the Sun rose behind the photographer. Of course, in the spring, the trees have thawed and Lapland looks much different. No, it's not an astronomy image. Nope, we have no control over what the APOD editors pick for APODs. Please don't take out your disappointment on the forum inhabitants. Thank goodness we don't have that much snow where I live!!! If temperatures are below freezing for months on end, and you get regular precipitation, this is what you'll end up with. I love this picture!!! Very bizarre figures there, I love pictures of white snow and winter, but I like to live in a warm country. Reminds me of figures appearing on Solaris, the planet described in Lem's novel...it was filmed in 1972. I don't mind looking at pictures of the frozen north when the sun is beating down and it is 75 degrees in the shade! A beautiful picture of the day! I love the picture; it's cool and refreshing! Those are some tough trees though! What a great picture. However, remember that Lapland and Laplander is an insult to the Samis. Some geographical term would be better. geckzilla wrote: Cool picture. Frigid, even. This image isn't astronomy related! What is this? Earth Picture of the Day (EPOD)??? chrisathena wrote: What a great picture. However, remember that Lapland and Laplander is an insult to the Samis. Some geographical term would be better. I don't see "Laplander" used in the description. Lapland seems to be the official name of the northern region of Finland. Not that I would know anything more than what Wikipedia tells me... but what would you call it, then, if it's insulting? However, remember that Lapland and Laplander is an insult to the Samis. Some geographical term would be better. 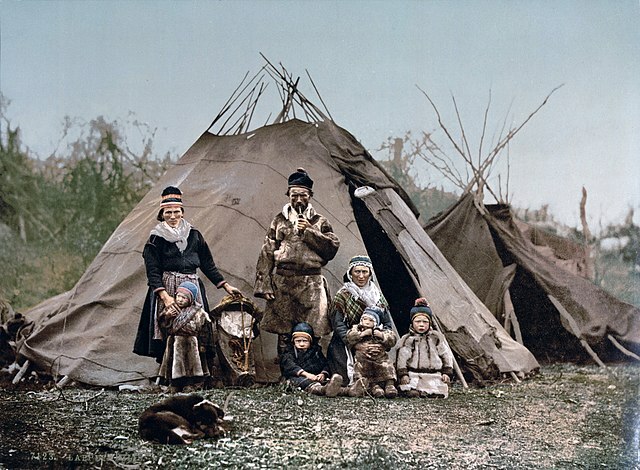 <<The Sami people, also spelled Sámi or Saami, are the indigenous people inhabiting the Arctic area of Sápmi, which today encompasses parts of far northern Sweden, Norway, Finland, the Kola Peninsula of Russia, and the border area between south and middle Sweden and Norway. Their traditional languages are the Sami languages and are classified as a branch of the Uralic language family. The Sami languages are endangered. Traditionally, the Sami have pursued a variety of livelihoods, including coastal fishing, fur trapping and sheep herding. Their best-known means of livelihood is semi-nomadic reindeer herding, with which about 10% of the Sami are connected and 2,800 actively involved on a full-time basis. For traditional, environmental, cultural and political reasons, reindeer herding is legally reserved only for Sami people in certain regions of the Nordic countries. The Sámi are often known in other languages by the exonyms Lap, Lapp, or Laplanders, but many Sami regard these as pejorative terms. Variants of the name Lapp were originally used in Sweden and Finland and, through Swedish, adopted by all major European languages: English: Lapps, German, Dutch: Lappen, Russian: лопари́ (lopari), Ukrainian: лопарі́ , French: Lapons, Greek: Λάπωνες (Lápones), Italian: Lapponi, Polish: Lapończycy, Spanish: Lapones, Portuguese: Lapões, Turkish: Lapon. The word Lapp is defined in the Lexicon Lapponicum as "Fenn". The first known historical mention of Fenni was by Tacitus, about 98 CE. The exact meaning of this old term, and the reasons it came into common usage, are unknown; in Scandinavian languages, lapp means "a patch of cloth for mending", which may be a description of the clothing, called a gakti, that the Sámi wear. Another possible source is the Finnish word lape, which in this case means "periphery". Originally, it meant any person living in the wilderness, not only the Sámi people. It is unknown how the word Lapp came into the Norse language, but it may have been introduced by the Danish historian Saxo Grammaticus to distinguish between Fish-Fennians (coastal tribes) and Lap-Fennians (forest tribes), supporting the second etymology. It was popularized and became the standard terminology by the work of Johannes Schefferus, Acta Lapponica (1673), but was also used earlier by Olaus Magnus in his Description of the Northern peoples (1555). There is another suggestion that it originally meant "wilds". An alternative interpretation, made by the Portuguese philosopher Damião de Góis in 1540, derives Lapland from "the dumb and lazy land", because a land where no vegetables grow is lazy and does not speak. The noun Lapp is an indication that the Sami people and Nordic history are related to a larger ancient history of Europe. In the North Sámi language, láhppon olmmoš means a person who is lost (from the verb láhppot, to get lost). The term Finn is occasionally used locally for the Sámi people in Norway, whereas local Finnish speakers are called kvæn. Finn seems to have been in much wider use in ancient times, judging from the names Fenni and Phinnoi in classical Roman and Greek works. "Lapland" is the name of a large area in northern Scandinavia where the Sami live. Northern Norway, Sweden and Finland are all parts of Lapland. I googled "Lappland" (as we spell it in Swedish) and found the image on the left. I wouldn't say that all of the red area in this picture can be regarded as "Lap(p)land". As you can see, the red area extends into Russia (Ryssland) as well. There is nothing particularly derogatory about the word Lapland, but the word isn't very precise. "Lapland" doesn't have any official borders. As you can see from the picture, the people who are indigenous to this area call their area Sápmi. I guess that, all things considered, the word "Lapland" isn't one I'd recommend. Here in Sweden, we rarely talk about either Lappland or Sápmi. We talk about the official regions in the north, such as Norrbotten and Västerbotten. There is a news program for Sami people on Swedish Television, called Ođđasat. Here is a page where you can read about the news program and about matters that are discussed here. Of course, you will have to read about it in Swedish, although I guess you might hear some of the Sami language here, too. They look like thinkers or the living "books" in Fahrenheit 451.